Hey CMM&S fans! 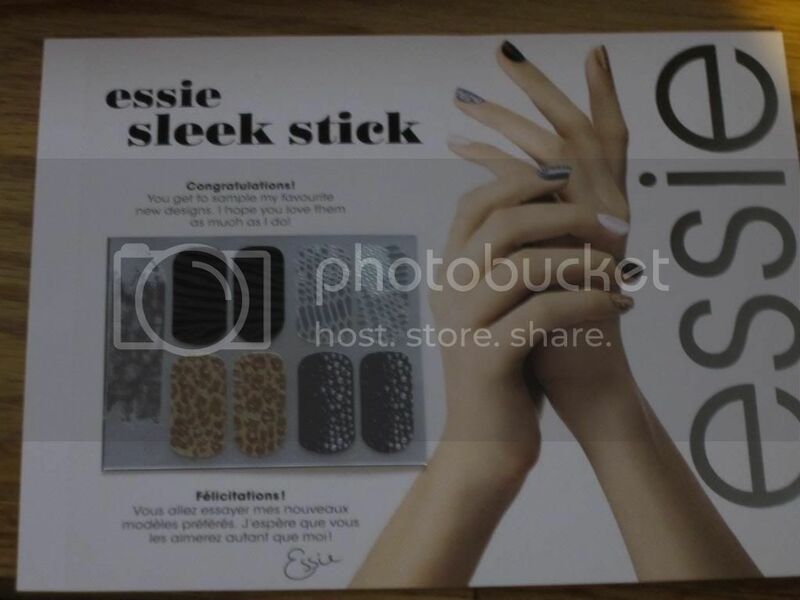 As I posted earlier, I received a sample of Essie Sleek Sticks nail stickers today. I thought I would do a quick review on them. This sample is no longer available, but Essie had a promotion available for 10,000 of these samples. 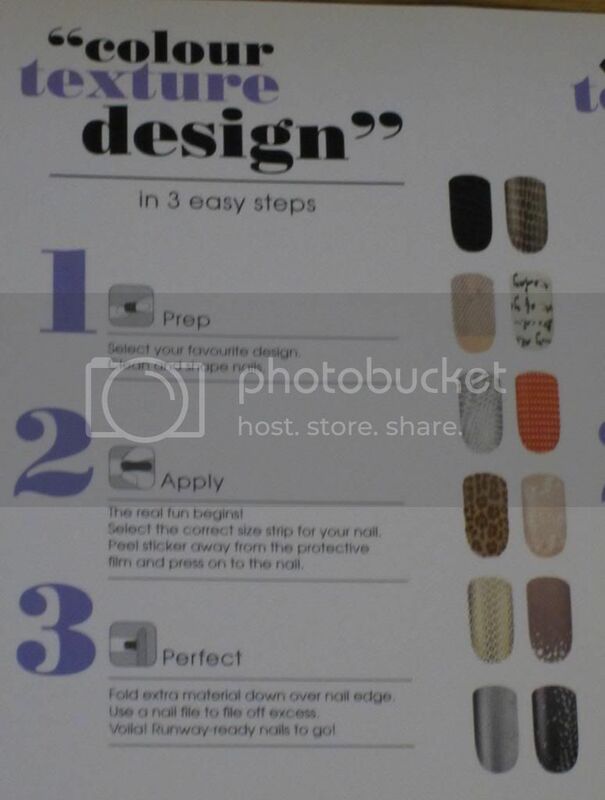 The sample consists of 4 of their new nail sticker designs, with two samples each. So essentially this sample is to get a feel for their nail stickers and designs to see if you would like them, but you won't be able to get a whole manicure out of them. The samples I received would only fit on my thumb and middle nails as they were too large for my other nails. The first sample I tried was the top, dark "Zebra" style sample. It would not photograph well, so I tried and took photos of the "Leopard" and the silvery "Snake Skin" type sample. On the back of the sample were the very simple instructions. "Select your favourite design. Clean and shape nails." "Select the correct size strip for your nail. Peel sticker away from the protective film and press on to the nail"
"Fold extra material down over nail edge. Use a nail file to file off excess. Voila! Runway-ready nails to go!" My very first attempt was with the dark "Zebra" style sample. I found that I ended up with a lot of little wrinkles with the sticker and filing it off just made all the wrinkles worse. So first attempt was a fail, and it didn't photograph well, so I figured I'd try again because practice makes perfect. My second attempt was the "Leopard" style sticker, which I put a wee bit too high on my cuticle area on one side, but this time went a lot smoother and I didn't have any wrinkles. With folding down the excess nail area on my first try, I just folded it down and filed at it with the corners bunched up. I found that it was much easier to fold down one side of the nail along the corner of my nail, file that and then work on the next side. It made it easier so there were less wrinkles and creasing. I do want to note, I was already wearing a regular base coat on my nails, which they didn't mention anything about not having, but it might make the stickers slide off more easily, I'm not sure. I found that they were really easy to file away. Originally I used a metal nail file, but switched to my glass nail file and found that the edge when using the glass nail file was cleaner. There were still some minor bumps on the edge, but after a bit of filing it ended up pretty smooth. 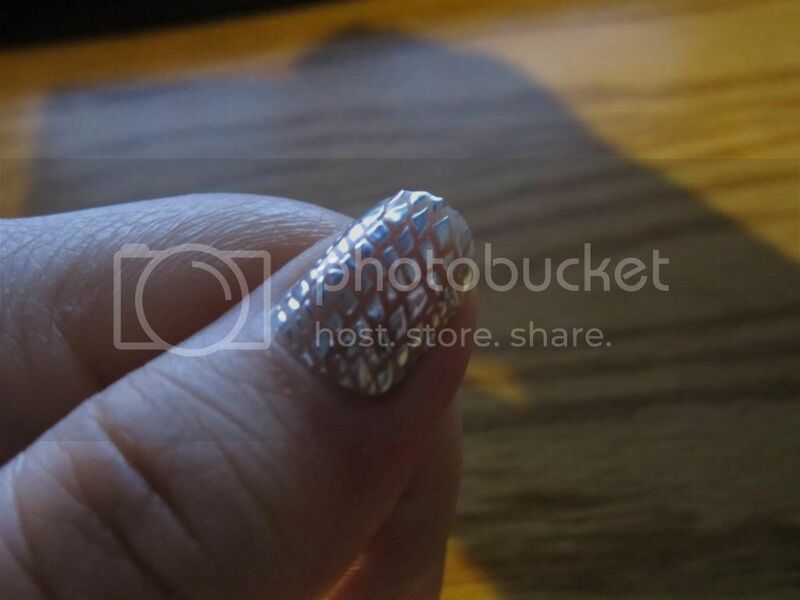 I did find with the stickers that if they didn't sit exactly right on your nail that the edges would catch on things, so you have to find the exact size for your nail, or a little bit smaller so that there is no overhang on the sides. I didn't try cutting them down at all, because I figured I would mess it up, but I suppose you could cut them down as well. The texture of the Leopard nails is interesting, however I'm the type of person that "plays" with my nails, so any bumps, ridges or anything like that will make me want to pick at my nails or even worse start biting at them. I have been really good lately with not biting, but I don't think anything textured like this is really for me. Overall, I think that these stickers would be great for a night out, or a special occasion where you don't want to deal with waiting for layers of polish or a nail art design to dry. They were easy to use, though I did need a bit of practice. The sets also apparently retail for about $10.00, so it's a hefty price for a one-use thing. I do have to mention, that they lasted a couple of days with only what seemed to be minor tip-wear. I took mine off before it actually had to come off, so it might have lasted longer. When taking them off, they did peel away my base coat, so I'm not sure how great they are for your nail bed, especially if you have fine, brittle nails and use them often, but if I wanted a quick, easy manicure, I might pick these up. The picture below is the finished product with the "Snake Skin" like sticker. I thought this one was the prettiest of them all. These ones aren't super sticky. They're rubbery and really easy to bend and shape to your nail, but they do stay on really well without the "sticky" factor.